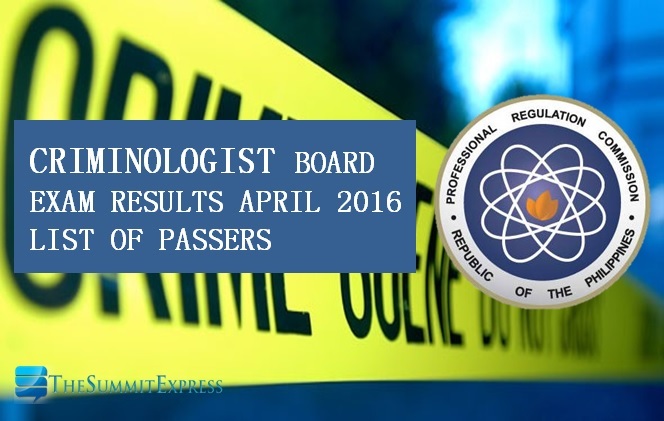 Those awaiting results of April 2016 Criminologist board exam can find here the complete list of passers, top 10 (topnotchers), top performing school and performance of schools as the Professional Regulation Commission (PRC) and the Board of Criminology released results in 11 working days after the exam. Check out full results of Criminologist board exam on this page. A total of 3,928 out of 16,435 passed the Criminologist Licensure Examination, PRC announced on Tuesday, May 17. PRC has administered the Criminologist board exam on April 27, 28 and 29 in the cities of Manila, All Regional Offices including Zamboanga, Bacolod and Antique. Starting May 23-25, 2016, registration for the issuance of Professional Identification Card (ID) and Certificate of Registration will be done on-line. Please go to www.prc.gov.ph and follow instructions for initial registration. Those who will register are required to bring the following: duly accomplished Oath Form or Panunumpa ng Propesyonal, 2 pieces passport size picture (colored with white background and complete name tag) and 2 sets of documentary stamps. Successful examinees should personally register and sign in the Roster of Registered Professionals. The three-day exam covered the following subjects: criminal jurisprudence, procedure and evidence and law enfocement administration (Day 1), criminalistics, crime detection and investigation (Day 2); and sociology of crimes and ethics and correctional administration (Day 3). According to PRC, the target release of Criminologist board exam is on Wednesday, May 18 or in 12 working days after the exam. In the same period last year, results were released in 13 working days from the last day of examination. PRC named 4,337 out of 14,696 who have hurdled the Criminologist Licensure Examination. In October 2015, results out in 24 working days. A total of 9,671 out of 29,591 passed the examinations. The Summit Express will update this page immediately for the list of passers, topnotchers and performance of schools once released online. Like Us on Facebook, Follow Us on Twitter or subscribe to our email list to receive real-time results.